Allianz Suisse, Wallisellen - Insurance Company, specially Mario Nese for his generosity! tibits AG, Zurich - Vegetarian and Vegan Restaurants, specially Christian Frei for great support! El Zonko from HAL-Media in D-Halle a.d.S. and his friends for their great free support with this Homepage and the designing and printing of flyers as well as cards! Anna Fleischhauer, Illustrator, D-Berlin, for designing your schoolflyer! Bora's stay at our small Hospice is since the 3rd September 2015 supported by Teuta Reshitaj. Thank you Teuta! Maike Brants is sponsoring Lucky Kay and Lena. Thank you Maike! Since 16th November Andrea Hunold is supporting our Blacky. Thank you so much! And Lola has found at once Matias Pietzonka as a monthly sponsor, since 1st December 2015..it is wonderful! Bardha is sponsored by Markus Nussbaumer since the 1st December - super! Manuela Ferrari took over the costs from Miky on 18th June 2016. And Thank you too, Daniel Gisclon, for sponsoring Hope since 22nd January 2016! 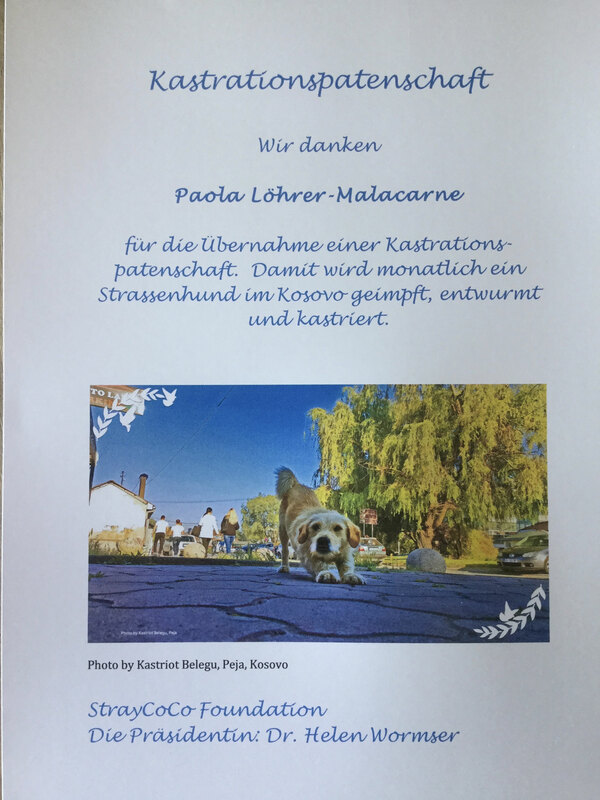 The 6 months old puppy Mala from Peja is sponsored by Selina Susanne Wörz since 14th August 2016. In October 2018 she was adopted by our worker Lulzim Sadiku - and will continue to be sponsored by Selina. Italia was found in Peja in front of the villagio Italia, the KFOR brought her to a death camp where we rescued her. She is sponsored by Adelina Krasniqi since end of July 2016. And Skinny is since 22nd October 2016 sponsored by Lilian Gisclon - we are grateful! Ariane has found her friend Bernard Leemann supporting her since 3rd November 2016! Again with us: Marianna Skopa, who sponsors Lisa since 7th February 2017 - Thank you! 14th March 2017 our Buddy found again a sponsor, Laura Shqipe Frei. We are grateful she took over Bobby as well. 25th April 2017 Christine Strack decides to support our Riki at Sanctuary - this is wonderful! 30th June 2017 Corinne Herzog starts to sponsor Eva, after Bella was adopted in Netherlands! Big Thank you! And thank you Monika Schär to sponsor Emma since 1st July 2917- And in December 2017 she takes over Luna, our motherdog. And on 18th September 2017 Alexandra Swetzer decides to sponsor Nolan, our newcomer from Peja, a few days later, 3rd October 2017 she takes over also the injured Husky Lea Luna, as her Luan is adopted.Great! And finally she also sponsors Nella, our newcomer girl. Athina Löhrer falls in love with Mona and sponsors her stay at our Sanctuary since 22nd October 2017. Great! Our puppy Juma, a survival, is supported by Qëndresa Sadriu. Thanks so much! New is in December 2017 Sabina Morina who takes over Beba, stray dog from Gjakova and the newcomer Orion. In January 2018 Marc P. Roth takes over Bardhi, in September 2018. Great supporter! Zoey back with us, is now supported by Stephanie Zoebeli - as Max has found a new home! We love you! Beba, street dog from Gjakova, found finally a home with us and a sponsor thanks to Sabina Morina. Since June 2018 Bruno Volkmer pays for Rafet who had heavy mange and is now recovering. Great! Together with Katharina Graf we find Maksim on the road from Mitrovica to Skenderaj. He was all alone, far from every house, so we took him back to our Sanctuary in October 2018, where he is now sponsored by Katharina. And Leila Karli sponsors now the sister of Lotta, Myla. Great thank you to both! 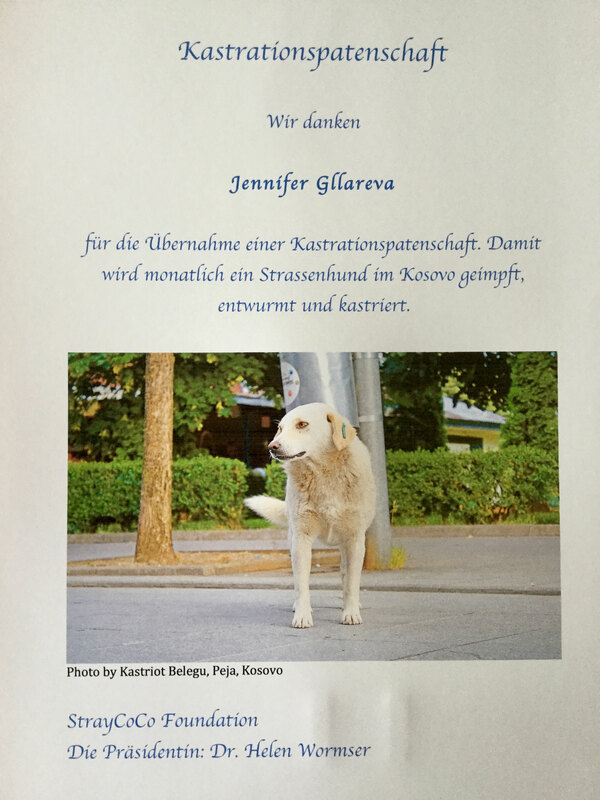 Since April 2019 is Gentrita Rrustemi on board - as sponsor of 4 puppies: Bubi, Mimi, Lilly, Luna. Great! And of course the president of the foundation, Helen Wormser, sponsors herself not only CNVR but also paid for the Sanctuary costs of Eddie and Alicia. As Alicia was adopted and is living now in Germany, Helen founds Lizzy, a very good mother dog who can stay at our Sanctuary. We miss Big Boss who died at the age of 13 years. We miss Shah, who had no chance to survive and Boverman that was euthanised by his adopter, who could not manage him and did not bring him back! Toni who must have lived too long in the streets and died after a few months in our Sanctuary. Bonny, the puppy, who could not survive as many many other puppies before, that all died of Parvovirus. And in the last days of December Foxy went from us, he survived mange and still died over night. And in May 2017 Sophie did not survive her surgery. Finally in August 2017 we lost Anna who lived 1 1/2 years in our Sanctuary and died of a tumor. Roki and Joey lived 4 years with us and had to be euthanised after months of suffering of Leishmania. Thanks to Paola Löhrer-Malacarne for supporting one treatment every month of a stray dog with 45 Euro! And Jennifer Gllareva is our second monthly supporter for CNVR! We are very grateful! Gerry and Toma leave with their soldier to South Tirol. Zyra is finding her new home in Austria. Polly and Laika are supported from Luxembourg and will soon be there. 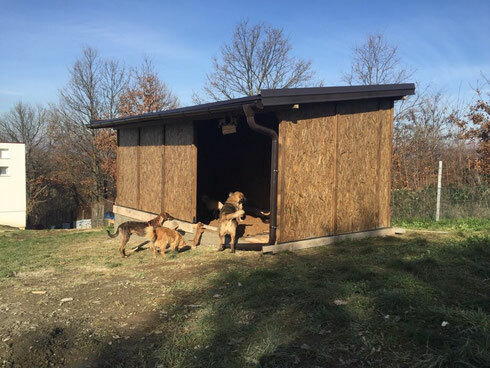 This stable was built thanks to a great donation of Dr. N. Bernhard from "Animals First & Only", Schweiz. It is the first time our invalid or sick dogs in the Sanctuary have a good isolated shelter against rain, snow and cold weather. They enjoyed it from the first day. Now it is filled with hay, thanks to the regular sponsors for every single dog.